Are You Ready For The E-Scooter Registration? E-Scooter Registration in Singapore will be made compulsory from the 2nd Half of 2018, similar to our E-Bike friends that went through the process from last August. Is your ride LTA Compliant? 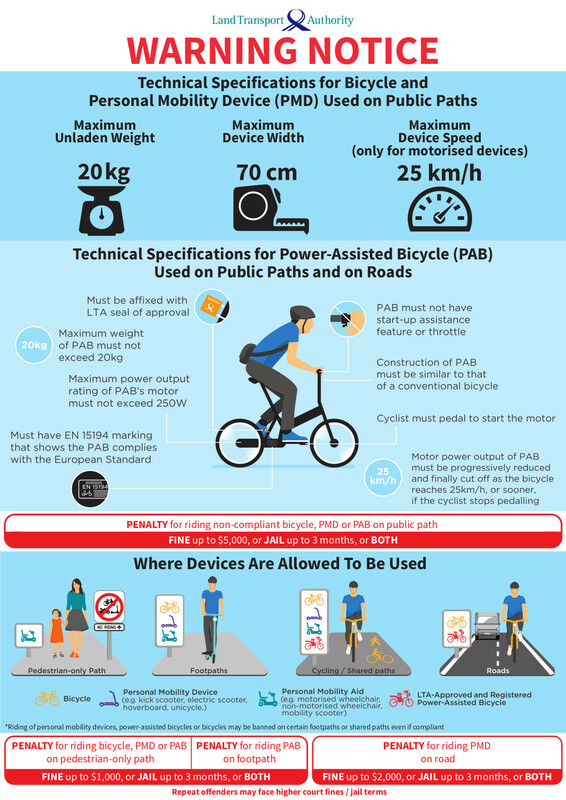 And if you have been following the news, you would know that the new law for all Cyclists, Personal Mobility Device (PMD) and Power Assisted Bicycles (PAB) was enforced on the 1st May 2018. This includes Rules for Retailers as well. And they do face a penalty with a maximum fine not exceeding $5,000, or imprisonment for a term not exceeding 3 months, or both, for the first time offenders. There is a list of rules and corresponding penalties applicable for retailers from LTA website. Since the 1st May ruling, quite a number of existing E-scooter users were affected. Device width could be manageable, but Speed and Weight is something that is very subjective. When E-Scooters were introduced, they were initially meant to be used as Last mile solutions – to get from home to the market or coffee shop, or to travel a short distance between home and MRT stations. This also leads us towards our Journey to a “Car Lite Nation“. And hopefully it can also help with the reduction of Carbon Footprints and saving the Environment too! E-Scooters are not allowed on the Public Road, so they can only share the footpath (currently, with speed or not more than 15 km/h), go on the Park Connector Networks (PCN) with speed or not more than 25 km/h, or go on private roads. We used to only see people (and pets) on footpath, so most pedestrians felt that these spaces should belong to them only. It is already quite frustrating when we meet some pedestrian who are glued to their Mobile Devices while walking – they had to complete their Korean Drama or send out some Whatsapp messages, so most of the time, we have to bear with them. Now that we have these PMD sharing the pedestrian footpath too, it might pose a danger if the Korean Drama watching pedestrian do not watch where they are going or the E-Scooter riders cannot stop in time to avoid them. The earlier E-Scooters were small and light – which also means that the rides might not be enjoyable on bumpy grounds – and some of our footpath are not exactly built for smooth rides too. However, some of our riders are also not of the lightweight kind, so these small rides are not very comfortable for them. The battery capacity is also not very high, thus it could only travel a short distance – not exactly useful for leisure rides round the park because one might run out of juice and have to walk or push the E-Scooter back home. But with the introduction of more heavy duty and powerful models, ie. the Dualtrons, one could balance better and ride more comfortably, and also travel a further distance! More groups were formed for friends to ride together during their leisure time too! Some of the riders can now use their E-Scooters as their primary means of transportation too – either for travelling to their work place, or using them for work as Food Delivery riders. However, with E-Scooters getting more powerful, another new group of riders (or individuals) were formed. They are known as the Black Sheeps! With the recent spotlight on accidents involving reckless E-Scooter riders and with much complain from the public, the Government had to do something! It doesn’t really help when some of these “Black sheeps” ignored the rules and rode on the road too! So, instead of saving the Environment, now the Environment is not Safe if these Black Sheeps are not stopped! We see some vehicles on the road that are capable of going at a much higher speed, but we do not see many reports of speeding cars in the news. Although there could be occasional Black Sheep Drivers too. Maybe due to the enforcement of Driver Improvement Points System (DIPS), motorists on the road tend to be more aware of their surroundings, and many errant drivers might have to think twice about the risk of getting their license suspended or knocking down someone. Perhaps a similar point system could be created for PMD users. Hopefully, with proper education, a “DIPS” for PMD users, and some form of compulsory training that each rider have to pass (like highway code and practical tests for motorists), maybe we could create a safer Environment for everyone again. Since 15th January 2018, heavier Penalties and Fines were introduced, for offenders caught riding on Public Roads – they not only get their PMDs impounded, there could be a possible jail term too! 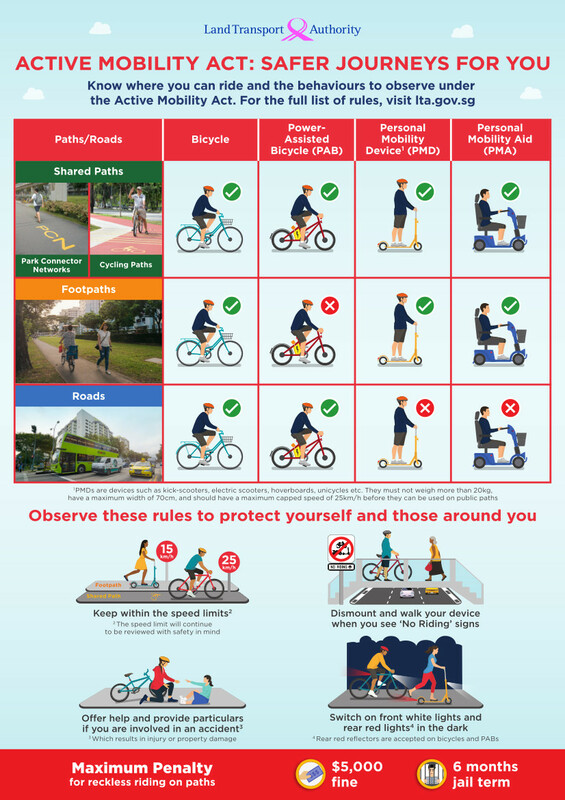 (source: LTA Singapore Factsheet). But some of these “Black Sheeps” just want to risk it – or maybe they do not read the news or have no friends to tell them about the new enforcement and regulations. Between January and September 2017 alone, 110 accidents were reported that involves Personal Mobility Devices (PMD) such as E-Scooters. Out of which, 30 occurred on public shared paths involving pedestrians, which the others happened on the road or road junctions where riding of PMD were not allowed in the first place! With the acceptance of the Active Mobility Advisory Panel’s (AMAP) proposal to make the registration mandatory, for E-Scooter riders on Public paths, the Government hopes that this could deter reckless riding, and makes tracking down “Blacksheeps” easier – but most importantly, it might create a safer environment for pedestrians too! Before the E-Scooter owners can register their ride, they will have to comply with the regulations of the Active Mobility Act and to ensure that their rides do not exceed certain limits. Details of the E-scooter Registration will be announced later, but it was mentioned that the process would require the E-Scooter owners to register with their own personal particulars and to paste Identification Stickers on their E-Scooters at a prominent place. Currently, other Personal Mobility Devices (PMD) like Hoverboards and Unicycles do not need to go through the registration process. If the final registration process requirements remains unchanged – ie. Max Speed at 25kmph (15kmph on footpaths), E-Scooter Max unladen weight of 20kg, and width not wider than 700mm (70cm) – quite a number of existing Escooter owners might not be able to register their current ride. Are you ready for the E-Scooter Registration when the time comes? You can save some bucks by paying for your ride through Online Shopping apps. You could still go to the shop to test the ride, but if you buy through Qoo10 or any other Online Shopping platform that carry the shop’s products, you could make use of discount codes and coupons – especially Qoo10, they usually have a lot of discount codes available! For our friends from overseas, you could be lucky enough to be in a place where the restrictions on the E-Scooters might not be as strict as Singapore. If you would like to receive updates, tips on how to reduce your E-Scooter’s weight, or grab some Online Shopping Discount codes, do sign up to our mailing list or join our FaceBook Page.